Interact face-to-face with clients and colleagues anywhere in the world—right from your PC or Mac—with the professional webcam designed exclusively for Cisco. 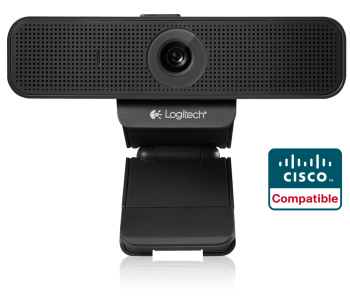 The Logitech C920-C integrates seamlessly with Cisco Jabber to deliver true-to-life 1080p HD video calls. With a 78-degree wide field of view, bandwidth-saving UVC H.264 encoding and omnidirectional mics, the C920-C brings high-quality UC video collaboration to desktops everywhere. Make a professional impression in vivid full HD video at up to a smooth 30 frames per second. Smooth 20-step autofocus keeps your video image razor sharp, even in close ups. Logitech RightLight 2 technology automatically adjusts for low light or backlit situations so you’re always seen in just the right light. Free up PC bandwidth with innovative technology that puts video processing within the camera. Two built-in noise-cancelling microphones are designed for crystal clear voice pick up in a variety of workspaces, including larger offices and small conference rooms. The extended view means they can see more of you—and you can move more freely without having to reposition the camera. And when the webcam is not in use, a convenient privacy screen covers the lens for added privacy and security. An integrated mounting clip and tripod thread give you the freedom to position the camera wherever it works best—LCD screen, notebook or tabletop. And with a single USB connection to Windows PC or Mac, the C920-C is plug-and-play easy to setup and deploy.